Hi, your closet is a mess. You know you should clean it out...but how could you ever part with that vintage gas station work shirt you got at a Goodwill in 1998? Here, an incredibly easy trick for buying yourself more room. 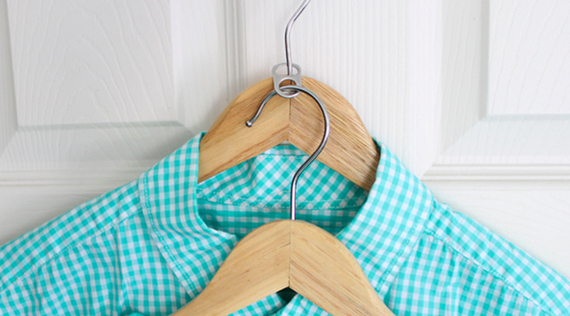 What you need: A pair of coat hangers with skinny hooks (not the chubby plastic kind) and a leftover soda tab. And then? Go to town hanging your shirts, blazers and (not too long) dresses. And consider it one more excuse to push the whole closet purge back a few months.